A psychotic break can happen suddenly but with the potential to cause lifelong issues. 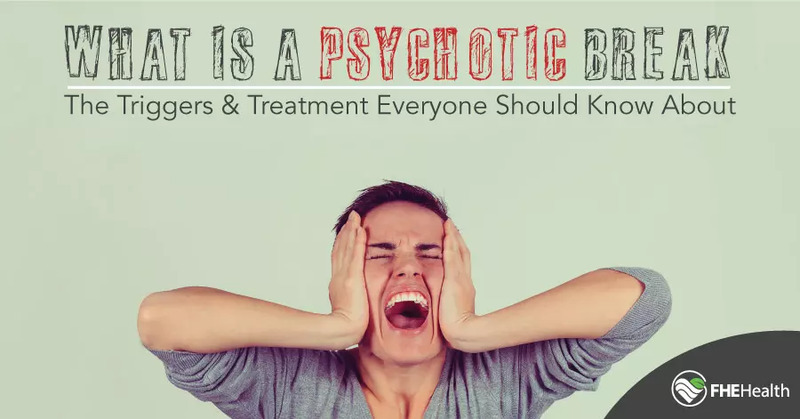 Learn what a psychotic break is, as well as the symptoms, triggers and treatments, so you can seek help appropriately or recognize risk factors or psychotic episodes your loved ones may be experiencing. Psychosis occurs when a person’s mind loses its grip on situations experienced or the reality they are surrounded by. If you are in the grips of a psychotic break or episode, you may not be able to understand that that’s what’s occurring. The thoughts going through your head and the emotions you are feeling may overwhelm your ability to act in a normal fashion. You may believe that the false beliefs or perceptions flooding your mind are, in fact, reality. This can cause you to make poor decisions or engage in dangerous actions. Psychosis may occur as an independent disorder or as a symptom of another mental illness. During a psychotic episode, you may begin to experience hallucinations. Although someone observing you or treating you will realize that your experience is not grounded in reality, you may not be able to discern that. After the episode, you may remember part or all of the hallucination as actually occurring instead of being the product of your mind. Additionally, you may be under the control of delusional beliefs during a psychotic episode. If you are able to discern that you are in the midst of a psychotic episode, you may feel frightened or angry. This can cause you to strike out at anyone who is with you at the time. If alone, the hallucinations or delusions may cause or convince you to harm yourself. The symptoms you exhibit may cause you to wonder if you are experiencing a psychotic break rather than a nervous breakdown. 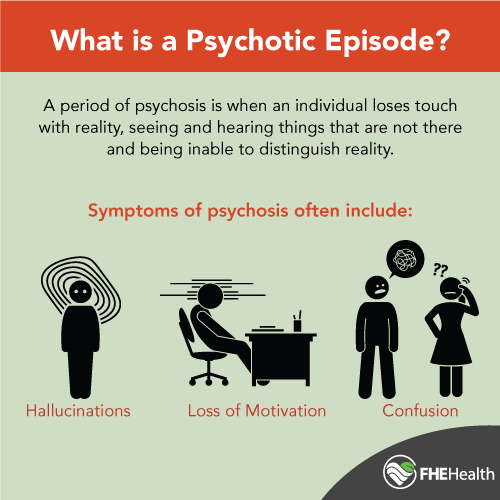 During the psychotic episode, however, you may believe that your experience is real. This can lead you to deny that you’ve had any type of psychotic break. If you are worried that you may be exhibiting psychotic break symptoms or even if you first wonder, “What is a psychotic break?” it’s important to reach out to a mental health professional or a trusted loved one to begin the process of obtaining treatment. At FHE, we will work to determine your diagnosis and provide the resources, counseling and any necessary medications in order for you to regain your hold on reality and prevent future occurrences. Spotting the signs of psychosis may be difficult for those in the midst of a psychotic break. Family members, friends and co-workers may be the first to observe psychotic episode symptoms. When that occurs, the person experiencing psychosis may not believe when their loved ones express concern or recommend seeking help. Once a psychotic episode ends, the people who compose your support system may be better able to reach out to you in ways not possible while the psychotic break was controlling your mind and actions. Hallucinating: Seeing people, places or objects that do not exist in reality or cannot exist in the manner in which they are seen. Hallucinations can also include auditory experiences — hearing people or incidents that are not currently with you or occurring. Delusions: Succumbing to beliefs not grounded in reality. Delusions may present in confusingly opposite ways, ranging from becoming suspicious of everyday occurrences or people you normally trust to believing yourself to be something you are not or have powers you do not actually possess. Disordered reasoning: Talking about or acting and thinking in a disorganized manner, including jumping between thoughts that are unrelated, equating beliefs that are actually divergent or making little to no sense in what you share with others verbally or in written form. Extreme anxiety: becoming enormously worried over situations that do not exist in reality or because of unreasonable fear and suspicion of others. This can lead to an inability to concentrate due to experiencing obsessive beliefs that distract from normal life activities. Catatonia: After a psychotic break or episode, your mind might become so overwhelmed that you slip into a state of unresponsiveness. This may be the result of your body’s instinct to protect itself from dangerous thoughts and actions during an episode or can trigger independently as your psychosis deepens. Psychosis can be triggered by many different medical and mental health issues, as well as occurrences in everyday life. That makes it important for mental health professionals to conduct a thorough examination of your health as well as your life. From this, you and your counselors and support team can determine how best to treat underlying issues while minimizing the psychotic break symptoms and building a plan to avoid future recurrences. Schizophrenia: this disease makes it hard for patients to discern reality from unreality. Patients diagnosed with schizophrenia may advance beyond this lack of discernment to experiencing a psychotic episode where those beliefs deepen or are acted upon. Bipolar disorder: During the manic phase of bipolar disorder, reality can slip away from the patient, and the resulting psychotic break can lead to dangerous behaviors common during mania. Psychotic episodes may also occur during the depressive phase as thoughts darken rapidly and lead to beliefs not rooted in reality. Common triggers of psychosis also include trauma and extreme stress. Who Is at Risk for Psychosis? Anybody, despite or because of their life experiences and genetics, can experience a psychotic break or ongoing psychosis. However, people whose close family members have a psychotic disorder may have an increased risk of developing one themselves. Additional risk factors include people who have the 22q11.2 genetic mutation, which can lead to psychosis and schizophrenia. Patients diagnosed with disorders affecting the brain may also have an increased risk of having a psychotic break. If you believe you may be at risk for psychosis, you may actually be in danger of believing yourself psychotic when you are not. Only a small subset of people who have genetic or other risk factors actually develop psychosis. If you believe this outcome to be inevitable, however, you may create a self-fulfilling prophecy of experiencing psychosis yourself. Speaking with a qualified healthcare professional can help you see the difference between a risk of psychosis and actual experience of psychosis. Only three people out of every hundred will experience a form of psychosis within their lifetime, with about 100,000 people suffering their first psychotic episode each year. Both illicit and prescription drugs may cause psychosis. This outcome is rare with doctor-prescribed drugs, although not unheard of, and is typically centered around stimulant medications and steroids. Prescriptions used illicitly and in very large doses may also cause psychosis, including antihistamines, antidepressants, anticonvulsants, pain medications and muscle relaxers. Street drugs, including cocaine and hallucinogens, can lead to psychotic breaks. Methamphetamines can lead to a particular psychotic disorder commonly referred to as meth psychosis, which can occur in up to 40 percent of addicts who use this drug. If you suffer from a substance abuse disorder as well as psychosis, it is extremely important to seek help as soon as possible rather than trying to manage detox and recovery independently. Drug withdrawal symptoms and experience can themselves cause psychotic episodes that are better managed in a safe clinical setting. The knowledgeable staff at FHE establish individual treatment plans to ensure you can break the hold that both drugs and psychosis have on your life. Psychosis relies on interrelated treatments that combine to address the acute phase of a psychotic break, as well as continuing maintenance of the symptoms and any underlying disorders. Antipsychotic drugs are typically the first line of treatment in cases of psychosis. This type of prescription response is customized for patients to address the schizophrenia, bipolar disorder or other mental health disease causing their psychosis. Other drugs in this class are best for treating specific psychotic episodes. Some commonly used medications include Seroquel, Risperdal, and Haldol. Complementary medications to address anxiety and depression may also be prescribed. Successful psychosis treatments also include intense psychotherapy. Methodologies like cognitive behavior therapy (CBT) can be effective in the treatment of psychosis. Ongoing therapy or counseling can be an important keystone to recovery, particularly in the case of underlying disorders leading to psychosis. In the case of persistent or chronic psychosis, ongoing drug and clinical therapy should be pursued. If you believe you have experienced a psychotic break or fear a loved one may be affected by psychosis, seek help as soon as possible. Contact us at FHE today to reach our highly qualified cadre of counselors. Our hotline is available 24/7/365 to help patients begin the road to recovery right away.